After a disappointing and uneventful Super Bowl, there’s luckily another big moment in the sports world right around the corner: March Madness. College basketball has been nothing short of exciting this season, with each top ranked team receiving a loss at one point in the year. Star studded teams filled with top NBA prospects have dazzled courts across the country, and now it’s that time in the season for teams to play their best basketball. Let’s take a look at the top-ranked teams in the game right now and which school could possibly come out on top as National Champions at the end of the March. Of course, everyone around sports may think Duke University is a mortal lock for the National Championship, and rightfully so. Their starting lineup features the best player in college basketball in Zion Williamson, the possible No. 2 and No. 4 overall picks in the NBA draft in R.J. Barrett and Cameron Reddish, respectively, and one of the best defenders in the country in Tre Jones. Oh, and did I mention, they’re all freshmen too. Head coach Mike Krzyzewski always does a good job at recruiting and leading his team and this year is no different. But the Blue Devils are certainly not unbeatable, as shown in their 89-87 loss to Gonzaga in the beginning of the season and a 95-91 loss in overtime at home to unranked Syracuse. 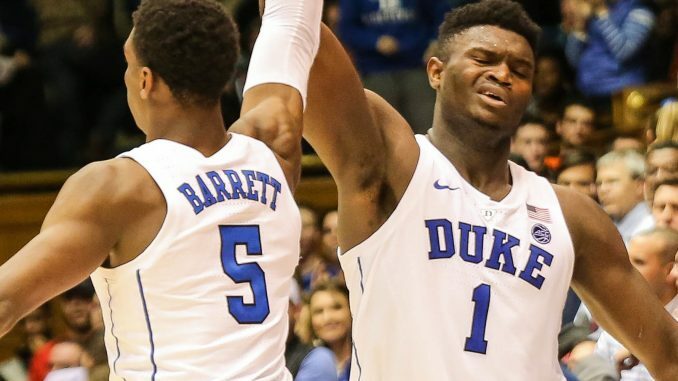 Duke is fourth in the country in points per game scoring 87 a clip, but a strong enough defensive effort and the ability to out-rebound the Blue Devils could be enough to tip them over during the big dance. Duke will have their biggest test of the season this upcoming Saturday, when they travel to No. 3 Virginia for an ACC showdown. The Blue Devils were able to pull out a 72-70 win at home against the top ranked Cavaliers on Jan. 19 without Tre Jones, and hope that his presence in this matchup will be enough to stop defensive-minded Virginia’s offensive efforts. The No. 1 in the nation Volunteers are one of only four teams with only one loss remaining, losing to Kansas 87-81 back in November two days after earning a strong win against Louisville. Since then, Tennessee has cruised through their schedule, going undefeated in the SEC so far and earning a resume-building win against top ranked Gonzaga. Although Tennessee does not have any top prospects for the NBA draft like Duke does, they rank right behind the Blue Devils in points scored per game, averaging 86 in each matchup. Ranking 84th in the nation in defense by allowing 67.6 points a game, the Volunteers have enough to make a strong run in the tournament. Playing in a conference much weaker than the ACC or Big Ten this season, Tennessee has yet to face their biggest challenge of the conference schedule. Some of these obstacles include playing No. 5 Kentucky twice and travelling to LSU and Ole Miss, will all be big tests in the upcoming weeks. It will be interesting to see if the Volunteers are the real deal, or just hiding behind an easy schedule. The most defensive efficient team in the country, the No. 3 ranked Cavaliers are holding opponents to only 52.9 points a game and remain one of the four teams with only one loss. They will have a week of rest before their biggest test of the season this upcoming weekend, when Virginia takes on Duke at home on Saturday and travels to North Carolina on Monday. Along with these two decisive matchups, the Cavaliers will have to take on Virginia Tech again on the road, Syracuse on the road and Louisville twice. The 72-70 loss to Duke was Virginia’s worst defensive performance of the season, and a game where they only shot 3-for-17 from behind the 3-point line. The Cavaliers are hoping their poor performance in the tough Cameron Indoor Stadium was just a fluke, and that they will put up a much better effort well rested and in front of their home crowd. Virginia’s remaining schedule in the ACC certainly is not easy, and at 185th in the country in scoring, it will be a big test to see if defense is really enough to win championships. With all the scandals and corruption that has gone on at Louisville in the past few years, many at the beginning of the season would be surprised to find the Cardinals ranked 16th in the nation right now without their leader Rick Pitino. However, Louisville finds themselves with one of the best resumes in college basketball right now, and will definitely have a good seed in the National Tournament. The 17-6 Cardinals have earned wins against Michigan State, North Carolina, North Carolina State and Virginia Tech, all top-25 teams at the time. Along with this, Louisville only has two losses against teams that weren’t ranked in Indiana and Pittsburgh. The Cardinals other losses came to Marquette, Tennessee, Kentucky and North Carolina. At 8-2 in the ACC, Louisville still has a lot of challenges to get through before postseason play begins. The Cardinals still have to play Florida State, Syracuse and Virginia on the road, while also playing the Cavaliers and Duke at home. February is going to be an interesting month for college basketball fans everywhere, and hopefully Louisville can make its case as to why they should be in National Championship conversations.